NOTE: All referenced scripts are available at https://github.com/vdanen/mutt-scripts. I've been using OS X on my desktop for a number of years now and unfortunately, the availability of email clients for OS X, while numerous, all stink. I'm coming from a background where on Linux I've always used the mutt email client. To be honest, I'm not a big fan of any of the GUI email clients on Linux either. Other than this, I just like "power-user" features, same as any other good geek. Needs to be fast, stable, and reliable. Too many email clients, while nice looking, fall flat here. So it was back to good-old mutt. NOTE: The current version as of this writing is 1.5.21 and is the recommended version of mutt to use. The latest official sidebar patch is for version 1.5.20 which does not apply to version 1.5.21. I've pulled a sidebar patch from Debian's mutt-patched package, and it is available here: Sidebar patch taken from Debian for 1.5.21. Then finish by compiling and installing mutt. Note that having fink setup is a good idea; you may need to install some packages via fink to satisfy build requirements. This will compile mutt with curses and regex support, with POP3 and IMAP support (and using header caching with IMAP), with SSL support, and will install it into /sw, the default location for where fink and friends live. New in 1.5.15 is SMTP support within mutt and it is fantastic. You will need to add --enable-smtp --with-sasl=/sw for that support to be available. You'll also want to install the cyrus-sasl2-dev package from Fink to get the SASL support (required for SMTP-AUTH). (This only seems to be a problem with OS X 10.6; earlier versions should not be affected by this). Once this is done, congratulations... the absolute easiest part is done (and you thought compiling software was difficult). Although mutt can handle POP3 and IMAP accounts, using fetchmail and procmail is much easier and more flexible. You can continue to download email in the background without even having mutt open, and by using fetchmail, you can hand the mails off to procmail to sort and so all kinds of interesting things with. In the above example we have two mail accounts, one with a username of "joe@server.com" which is a POP3 account (using SSL). The other is an IMAPS (IMAP over SSL) account with a username of "jimbob". As you can see, you'll need to first install Growl and the add-on CLI program (growlnotify). One of the most fantastic filters available is procmail. This beast will let you do pretty much anything you want to your email. Smart mailboxes and simple filters? Give me a break. This puppy puts the filtering capabilities of Mail.app to shame. That essentially does no filtering, except for weeding out duplicates, and puts all of your emails into ~/Mail/Inbox. That in itself is pretty much useless... the whole point is to give us power and flexibility. There are plenty of tutorials on tweaking procmail, using Google to search will give you plenty of hits. So far we have fetchmail retrieving our email, procmail filtering our email, and an unconfigured mutt to (eventually) read the email. However, there are a few niceties we can also include to make using mutt so much nicer. The first is a little cocoa program called MailtoMutt. This little gem essentially is a "mailto:" url handler. So when you click on an email link on a web page, instead of opening Mail.app or some other GUI email client, mutt will get the focus and take that address to start a new message. Installing MailtoMutt is as simple as downloading the dmg file, mounting it, copying MailtoMutt.app to your Applications directory, and running it. To make it the default mailto: handler, you'll need to either use RCDefaultApp or fire up Mail.app and set the default mail client to MailtoMutt. 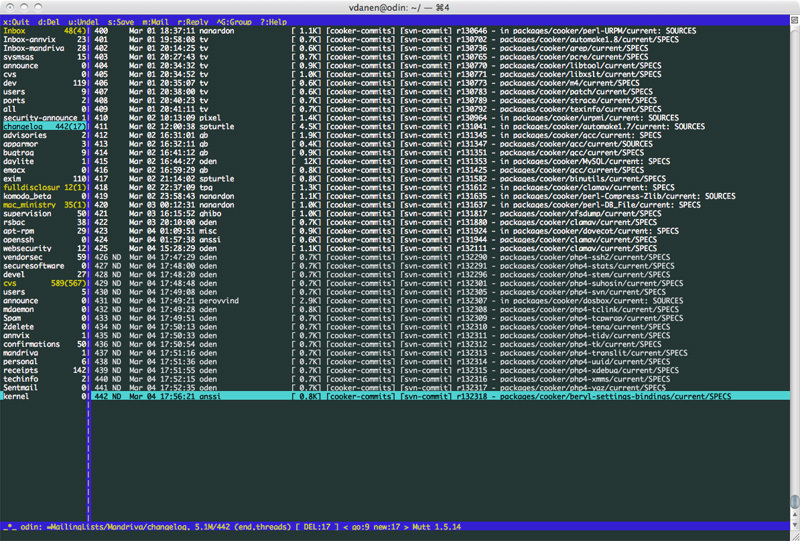 The only downside here is that MailtoMutt launches a new Terminal window, launches mutt to send the mail. Depending on how you have Terminal configured, you may need to manually exit/close the window after it's used. However, since I don't usually click on too many mailto: urls, I think it's not that big of a deal. This will configure lbdb with GnuPG support and install it into /sw, the same place that mutt itself lives. You will need to create ~/.lbdbrc which is the configuration file for lbdb. It configures what lookup methods to use with lbdbrc (the mutt alias file and OS X Address Book, plus whatever else you want to be able to lookup (you could use LDAP, for instance)), and some other preferences. This allows you to address emails to any user in your OS X Address Book using mutt's lookup completion (query_command). More on that in the mutt configuration later. This little program takes the input of a file (such as an email message) and prints out links to everything, which you can then navigate around, highlight, and press enter to open them. This then uses the standard open command to open the URL, which will in turn call your default web browser to open the URL (Safari, Chrome, Firefox... whatever you have defined as your default web browser). Create the ~/.mairixrc to create your configuration for Mairix (sample below), and the ~/.mutt/msearch.sh script that does the actual searching (sample below). This script will delete any existing results folders, update the index, and then execute the search. macro index "\em"    "<shell-escape>$HOME/.mutt/msearch.sh " "Run a Mairix search"
macro index "\ef"    "<change-folder-readonly>=mairix-search\n" "Switch to Mairix search results"
macro pager "\em"    "<shell-escape>$HOME/.mutt/msearch.sh " "Run a Mairix search"
macro pager "\ef"    "<change-folder-readonly>=mairix-search\n" "Switch to Mairix search results"
This will bind the search command to ESC+m (or ALT-m) and then create a change-folder command to go to the search results folder (ESC+f or ALT-f). I put that at the top of the list, so it's always first. Now you can hit ALT-m and provide your search criteria (like f:foo@foo.org to find all messages from foo@foo.org in all the indexed mailboxes), then hit ALT-f to go to the search results folder. Essentially, this calls "open" to open the file, which will use your default application (so if TextEdit is the default handler for MS Word files, if you open a Word attachment, it will open in TextEdit). New in mutt 1.5.15 is SMTP support within mutt itself. Older versions will need to use the sendmail interface, which requires a properly configured postfix or exim (or some other MTA) server. With mutt 1.5.15 and later, you no longer need to configure postfix or exim as noted below (although those sections remain because some people may prefer the flexibility that using a full-blown MTA provides). If you compiled mutt with SMTP and SASL support, you have full support for SMTP-AUTH; if you did not compile with SASL support, you can only do straight SMTP negotiation with no authentication. If you didn't compile with SMTP support, well, you'll need to use the sendmail interface or recompile. The smtp_url command defines the url to use, and is of the form "smtp[s]://[user[:pass]@]host[:port]/", so in the above example "user@host.com" is the username to use, "secret" is the password, and "smtp.myhost.com" is the SMTP server to connect to. Using smtps:// instead of smtp:// to use SMTP over SSL. The smtp_authenticators command is only available if SASL support has been compiled in, and can consist of one or more of "cram-md5", "digest-md5", or "gssapi". If left unconfigured, mutt will attempt to use the most secure to the least secure in order. With these two commands enabled, you no longer need to set the "sendmail" command, nor do you need to have a locally-running SMTP server for mutt to relay mail through. However, if you prefer, you can setup postfix on OS X as a mail delivery relay in the next section. By default, OS X uses postfix for local mail delivery. You can install another MTA, such as exim, if you like, but postfix works fine. It does need a little bit of configuration because mutt will send mail via the local MTA, so it's the MTA's job to do the final delivery. Unless you have a static IP that's resolvable on the internet, chances are any mails you send out will be rejected, so you need to tell postfix to forward mails on to your ISP's mail server, for it to do the final delivery of. The easiest way to do this is to edit /etc/postfix/main.cf. Now, how you do this will largely depend on your ISP's SMTP server's configuration. I relay through my own remote SMTP server, and it uses TLS and authentication. The configuration you need to take may be different. This is all added to the end of the file. The only thing here that isn't from my real configuration file is the relayhost setting. Everything else is exactly as I have it configured. You can elect to keep the saslpass file around, if you like, just make sure to give it 0600 permissions as well so no one can snoop at it since it does store your password in cleartext. Because, by default, postfix isn't always running, there is no need to reload the postfix service. If you see something similar to the above, you'll know it worked (yes, the above was obfuscated a bit). On a side note, if you don't mind parting with a few dollars, you can also use PostfixEnabler on OS X to do this for you. I haven't registered this but played with it on a friend's system who has and it seems fairly nice, although you will want to chmod a few files in /etc/postfix, in particualr the sasl_passwd file is mode 0644 and it's the file that contains the cleartext password. Other than that it seems like a pretty straightforward program. While postfix might do the job ok, I prefer something like Exim which is, in my opinion, a much better MTA. So this, entirely optional, step is to use exim instead of postfix. The above creates a dedicated system user "exim" to use. NOTE: There is a problem with setting exim as the default MTA for the entire system, which I didn't realize immediately. If you set /usr/sbin/sendmail as a symlink to /sw/bin/exim, when you do a Repair Disk Permissions via Disk Utility, the suid bit on exim-4.66-1 gets removed. Disk Utility stupidly follows symlinks and since /usr/sbin/sendmail isn't suid, it follows the symlink to the resulting binary (in our case, /sw/bin/exim-4.66-1 and removes the suid bit. This will break exim! This way, mutt will use the symlink we created, and Disk Utility will never remove the suid bit from the real exim binary because it won't know about it. Note that /sw/bin/exim is actually a symlink to /sw/bin/exim-4.66-1; however the advantage of symlinking to the non-versioned symlink is that you can upgrade exim without ever changing the sendmail symlinks as the "make install" for exim will update /sw/bin/exim to point to /sw/bin/exim-[version]-[build]. You can have exim start at boot, or you can simply use it to push mails as it receives them. The better idea is to have exim up and running so that it's queue-runner can work automatically. If you don't want other systems to be able to use the SMTP server on your laptop/workstation, either firewall off port 25 or tell exim to listen to the localhost only (by setting local_interfaces in the configuration file). to the plist, immediately after "<dict>" and before "<key>Label</key>". Once these changes have been made, you will need to reboot for them to take effect. This is an extremely basic exim.conf file, but it suits the purpose. It isn't meant to be used for anything other than relaying mail from this host to the smarthost (mail.domain.com as seen in the send_upstream router above). About the only things you need to configure here are the username and password in the fixed_cram authenticator and the smarthost domain name (or IP address) in the send_upstream router. The above will also only accept mail from the local machine; it binds to port 25 on 127.0.0.1 and will accept mail from that, and also locally via /usr/sbin/sendmail; otherwise it does not accept mail from any other system (which is important considering how loose the security on it is considering it will take any mail, unauthenticated, and send it on, authenticated, to the smarthost). If your upstream SMTP server does not require authentication to relay mail, be sure to comment out all of the auth-related options (as noted in the config above). Once you've made those changes and rebooted, exim should be running and working nicely. It logs via syslog, so you can see what it's doing by looking at /var/log/mail.log. Because mutt runs in the terminal, there are a few little things that should be done to make it work a little nicer. For instance, the sidebar patch, by default, suggests using CTRL-O, CTRL-P, and CTRL-N to navigate the sidebar but I found that CTRL-O doesn't work at all. The solution was to use meta keys to navigate, but by default this won't work. This will make escape commands accessible via the meta key as well (typically the ALT key). So, for instance, "\ep" will work with ESC+P and ALT-P. But Terminal doesn't support/use the meta (ALT) key by default. To do this, you need to enter Terminal's Window Settings, then select Keyboard. Make sure the "Use option key as meta key" checkbox is enabled. On a Mac keyboard, the ALT key is the OPTION key, so this will properly map the meta key strokes, allowing us to define "\ep" as ALT-P (aka OPTION-P or META-P). At this point, you can use ALT-P to move up the sidebar, ALT-N to move down it, and ALT-O to open the highlighted mailbox. This also allows you to create a whole host of keystrokes for other commands that you would otherwise have to use the ESC key to access. Now comes the fun part... configuring mutt itself. Mutt itself can be a bit of a beast to setup the first time around. The first thing to do is to create the configuration directory where all of the mutt files will live: ~/.mutt. The main configuration file is ~/.mutt/muttrc. I prefer a modular approach to one huge monolithic configuration file and mutt lets us do that with various source options in the configuration file which you'll see. Most of this is largely personal preference and the configuration files are included to be perused. There are a few important things that need to be set to make all of this work well. The only files omitted from the above list are the ~/.mutt/signature* and ~/.mutt/aliases files (they should be pretty self-explanatory). source ~/.mutt/auto_views               # Define auto_views. source ~/.mutt/aliases                  # Load in my aliases. source ~/.mutt/subscriptions            # Define the list of subscribed mailing lists. source ~/.mutt/mailboxes                # Define the list of folders that receive mail. source ~/.mutt/headers                  # Configure header display. source ~/.mutt/folder-hooks             # Define folder-hooks. source ~/.mutt/save-hooks               # Define save-hooks. source ~/.mutt/fcc-hooks                # Define fcc-hooks. source ~/.mutt/message-hooks            # Define message hooks. source ~/.mutt/bindings                 # Define key bindings. source ~/.mutt/macros                   # Define macros. source ~/.mutt/colours                  # Define colours. Each of these are separate configuration files that get included by mutt when it starts up. This makes configuration much easier by keeping things separated. This is really important if you're using exim, as it will set the Return-Path properly and other envelope information. If you are using exim, be sure to keep untrusted_set_sender = * set so that exim doesn't rewrite the Return-Path. This will use lbdbq (part of lbdb which we configured already) to do queries for looking up email addresses. Where the mailcap definition file is, which we've already configured. If you want to use special function keys in mutt, there are a few steps you must first take. These involve disassociating the function keys with the rest of the OS X system and Expose. By default, F9 through F11 are reserved for Expose, while F12 brings up Dashboard. These can be changed by going into System Preferences and the Expose & Spaces preference pane. Here you can either re-map the functions you want to a different key, or set them to "-" to disable them. Typically I active Expose via extra mouse buttons, so disabling them entirely here is fine (also note the new Expose features in OS X 10.6 make it less necessary to have all these mapped unless you absolutely want to activate via the keyboard). For the F1 through F8 function keys, go to the Keyboard preference pane and select the "Use all F1, F2, etc. keys as standard function keys". This will prevent the system from using F1 to dim the screen (on an Apple keyboard); instead you must use Fn-F1 to do it. This leaves the F1 key free to use. This will bind the F10 key to the "sidebar-prev" command in the index. This wrapper will open TextMate to edit emails, tell the calling app to wait for TextMate to close the file, and position it at line 12. You need to do this so you can use the Mail bundle (essentially we just move the file to one named *.mail so TextMate recognizes it as a "mail" file, then move it back when we're done). The only problem I have with this is that TextMate doesn't do hard-wrapping, so you can't tell it to use column 72 or something as a hard-wrap; you'd have to manually reformat your mails before sending them or write a snippet to do that (I haven't gotten far enough in TextMate to know how to do that yet). Alternatively, TextMate's mail bundle will identify a text file as being of the mail type (with the Mail bundle installed) if it starts with the "From:" line. With a little bit of configuration changes, this is easy. set editor            ="mate -w -l 8"
This directly sets the editor the the mate command and re-orders the headers to ensure the "From:" header is first. With this method, there is no need for an external file to call the editor. Of course, with a little creativity, you could use the mate_mutt to differentiate between a local/GUI connection and over ssh. In other words, depending on the environment, it would use vim (if remote) and TextMate (if local). This script uses enscript to make a pretty output to a postscript file, which is then converted to a PDF via pstopdf, which is finally opened in Preview so you can then print or save the PDF. It will also remove any existing PDF's in the temporary directory prior to creating the new one, so you don't ever really have to worry about cleanup. A lot of this can be used to configure mutt on Linux or any other operating system as well. lbdb works great and can use LDAP, the Evolution address book, and so on. Everything with the exception of the urlview configuration and MailtoMutt, and maybe a few other bits, are fairly generic. Finally, I'm always interested in tweaking mutt more, so this article will likely be updated on a semi-regular basis. If those of you reading this have better ways of doing things (or more unique ways of doing things), I would love to hear about it. In particular, I haven't yet gotten the function keys, (F1, etc.) to work in mutt, and would love to be able to do that (well, they probably work fine in mutt, it's Terminal that would be the problem). Finally, anyone getting TextMate to work in a sane manner with mutt (so as to not have to manually wrap lines), please let me know how you did it!